People love and remember the novels of Bobbie Ann Mason because they ring so true. This dazzling memoir saga of three generations, their aspirations, their conflicts, and the ties that bound them to one another. 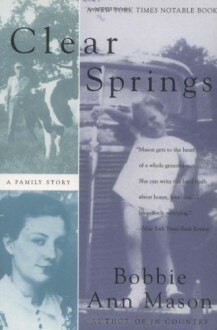 Spanning decades, Clear Springs gracefully weaves together the stories of Mason's grandparents, parents, and her won generation. The narrative moves from the sober industriousness of a Kentucky farm to the hippie lifestyle of the countercultural 1960s; from a New York fan magazine to the shock-therapy ward of a mental institution; from a county poorhouse to the set of a Hollywood movie; from a small rustic schoolhouse to glittering pop music concerts. In the process of recounting her own odyssey--the story of a misfit girl who dreamed of distant places--Mason depicts the changes that have come to family, to women, and to heartland America in the twentieth century. Ultimately, Clear Springs is a heartfelt portrait of an extended family, and a profound affirmation of the importance of family love.